Danni tells Wayne she regrets going to Mr Roland since he embarrassed her; she only wanted Briggs to stop hassling her. Wayne says it's probably better for it to be out in the open and nobody will think any less of her. He suggests she talk to somebody but Danni says she can handle it. Lou is amused to find Rick reading a car repair manual and asks if the old rust bucket is giving him problems but Rick says he just wants to learn to maintain it. Lauren comes home and answers the phone. It's Annalise who wants Rick to go in to the coffee shop urgently. Lauren tells Lou she has quit, and if Rick has half a brain he'll do the same. Cody wonders what prompted Doug to have a man- to- man chat with Michael. Michael says her parents must figure they're getting serious. Cody says she likes things the way they are. Michael wouldn't mind going the whole way as it's what everyone already thinks. Cody says they shouldn't just do it because it's expected of them. It's a big commitment and she's not ready for it. Michael says he is ready but Cody says they have plenty of time. Annalise tells Rick she let Kristy and Lauren go home because they had important things to do. RICK: Lauren was at home and it didn't look too important to me. ANNALISE: Oh, really? She must have lied to me. I must sack her for that! Annalise serves coffees to Danni and Martin. Danni says she can't show her face at school any more. Martin says he'll get her a pamphlet about how to cope in this situation and assures her she took a good step today. He tells her the kids at school will get used to it and she can always cry on his shoulder, which Danni looks happy about. Wayne tells Mr Roland that Danni is upset about him humiliating her. Mr Roland says he only did what Danni asked him to do and yells at Wayne not to tell him how to do his job. 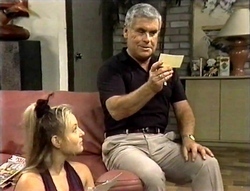 Lauren is looking through a box of Lou's old stuff when Lou comes back in the house complaining about Rick's car leaking oil all over the driveway. Lauren shows him an old photo to remind him his first car was a "hotted up number" too. LOU: Do you know, I used to go cruising the streets in this, trying to impress all the good looking girls. That's how I met your mother, actually. Picked her up outside a fish and chip shop should have left her there! Martin has to leave. Danni thanks him and gives him a kiss. Martin looks a little surprised and leaves. Michael says Martin is a bit old for Danni but Danni says girls mature faster than boys and need someone with more experience. Michael boasts that that's not a problem for him and Cody. Rick overhears and doesn't look happy. Annalise is complaining about people not wanting to work for their money. Wayne is trying to do marking and gets frustrated with her. Annalise leaves to see Lauren just as Lou arrives and wants to know what Mr Roland is going to do about Danni. Wayne says there's not much Roland can do, but he will personally keep his eye on her. Lauren is amused that Annalise is grovelling and asks what's in it for her if she comes back to work. Annalise says she'll forgive her for walking out! Rick arrives home and Annalise grills him about leaving early. Rick pretends he left the money sitting out and didn't lock the door but Annalise isn't amused. ANNALISE: If you're not going to take your job more seriously I'm going to give all your shifts to Lauren. LAUREN: Actually, I have just been reminded how awful you are to work for! My resignation stands. Annalise leaves and Lauren tells Rick she may have found a way to get Lou to stop hassling him. She shows him the old photo. Michael thinks Cody thinks he's too young to take things further but Cody says they are both too young. She says he seems really worried about this but Michael unconvincingly says he's happy if she is. Lou, Lauren, Rick and Danni are eating dinner and Danni is expecting Martin. She's disappointed when Lou says Martin dropped a video by earlier. Danni goes to her room and Rick says he thinks Danni has got the hots for Martin. Rick is going to go out in his car and Lou tells him not to go hooning around. Rick reveals he knows about Lou's days as a hoon and Lauren makes a quick exit. 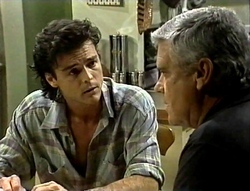 Lou tells Rick that driving is dangerous and he can't afford to take chances. Lauren tries to convince Wayne to take a break but he's got too much to do. Lauren suggests he has taken on too much. Wayne promises he's all hers when things have settled down. Lauren warns him that if he keeps pushing himself something's got to give. Danni doesn't want to talk to Lou about what happened at school today and says Martin's looking out for her. Lou tells her not to confuse Martin doing his job with something else. Danni insists Martin really likes her and she's not going to let Lou stuff it up for her. Annalise is waiting for Wayne the next morning. ANNALISE: Come on, Wayne, I could have walked to work by now. WAYNE: So Why didn't you? ANNALISE: Because it would have ruined my shoes! Wayne notices someone has slashed all his tires. Annalise asks who would do that and Wayne says probably a disgruntled school kid. Annalise says they should remember all the extra effort he puts in for them. Wayne doesn't know why he bothers. Annalise arrives late, much to Rick's amusement. Danni and Martin are having a coffee and Danni asks Martin if he's only seeing her because of her diabetes. Martin says he has to be professional. Danni says she's just another case study and storms out. Michael and Cody are getting ready for school. Cody is suspicious of Michael acting gentlemanly and asks if he's going to drop her. Michael insists he understands about her saying no. Cody says she doesn't want to mess things up like she did with Drew. Michael asks how come she didn't think she was too young for Drew and Cody says it was different; Drew was special. Michael unsurprisingly doesn't take this well and walks out. Danni is back home and can't face school today. She tells Lou that Martin isn't interested. Lou says he tried to warn her because he didn't want her to get hurt. Danni asks why nobody likes her for who she is. Lou says he does, but she doesn't make it easy for people. Rick tells Wayne he heard someone slashed his tires. Mr Roland comes in the room and Rick says he's a likely suspect! Roland wants to know why Wayne wasn't in the teachers meeting this morning. Wayne explains about his tires and says he was working all night. MR ROLAND: We're all busy but the rest of us are able to maintain some professional etiquette. WAYNE: Yeah, well that's rich coming from you. MR ROLAND: What was that, Duncan? WAYNE: Well, I wouldn't call your handling of the Danni Stark situation yesterday very professional. 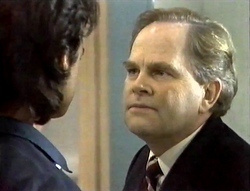 MR ROLAND: Careful Duncan, it's starting to look as though you've got a vested interest in this schoolgirl. WAYNE: And what's that supposed to mean? MR ROLAND: Well your intentions in the past have been questionable. WAYNE: The board cleared me of those charges. MR ROLAND: Well I'm starting to wonder if the board were mistaken. 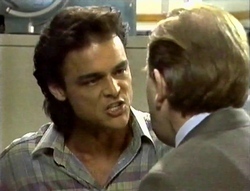 Wayne lashes out and floors Roland!